Are you looking for handmade Adirondack Chairs from Canada, made from the finest western red cedar wood? You’ve come to the right place right here at CanadianChair.com. Canadian Chairs are luxurious wooden garden chairs that are renowned for their fantastic seating comfort, high quality and durable character. 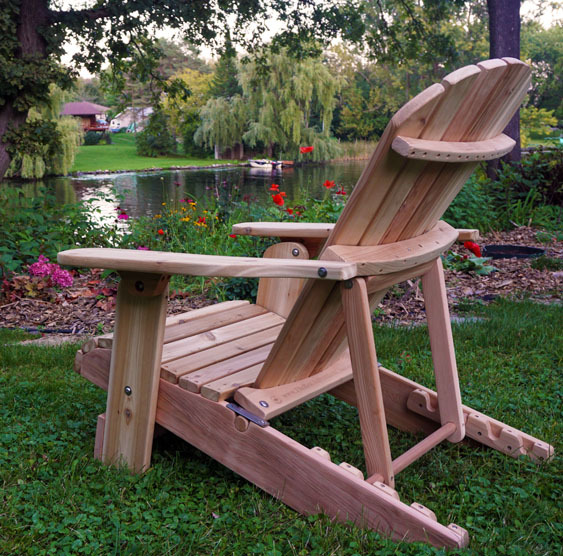 Adirondack Chairs are almost completely pre-assembled and do not require additional gluing or oil treatment. Besides Adirondack Chairs you will find Adirondack Tables and Adirondack Footrests. You can also contact us for Classic Accessories® furniture covers, maintenance products and the possibility to give your Adirondack furniture a personal touch by having it engraved. Do you like security? Buy Adirondack Furniture at CanadianChair.com. You get a standard 10-year guarantee. Even if you leave the Adirondack Chairs untreated outside year-round! Would you like to see the Canadian Chairs live or would you like to try them out? No problem. All Adirondack Garden Furniture can be viewed in our showroom by appointment. Call +31 (0) 227 82 33 54 or send an email to: info@canadianchair.com. Of course you can also order online. See you at CanadianChair.com!